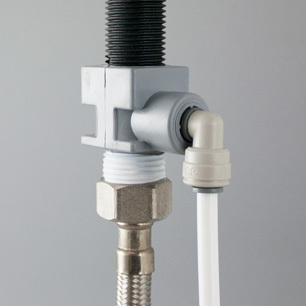 Use only for installations where the cold water goes to the faucet via a flexible connector. Turn off the undersink cold water valve, then remove the flexible hose from where it connects to the 1/2" faucet stem. Install the EZ connector onto the faucet stem, and attach the flexible tube to the lower male thread of the EZ adapter. Be sure the washer is in place in the EZ Adapter before attaching it to the faucet. Insert the tube/valve assembly into the EZ Adapter. Just plug the rigid elbow into the Quick Connect fitting on the side of the adapter. Turn the inline valve off (at a right angle with the tubing) and turn on the water to the faucet and check for leaks. Now, install the free end of the 1/4" tubing into the inlet port of your water filtration unit. The inline valve is now the on/off valve for the unit. When you're ready to send water to the unit, turn the valve on.